The Silverback is a huge tracked tank destroyer, more massive even than one of the Slammer’s M2 blower tanks. It has a 25cm powergun as main armament, backed up by a pair of remote tri-barrel 2cm powerguns on each of the crew hatches. An assault gun version has a twin over-under shotgun-style weapon which fire ‘beehive’ canister rounds for clearing massed infantry attacks. 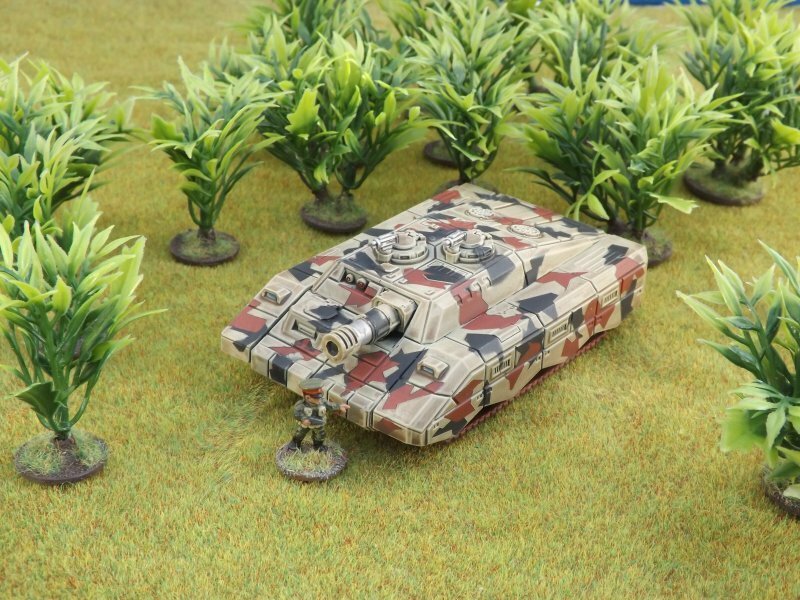 The Nonesuch National Guard are the primary users of the Silverback – they also use smaller tracked vehicles, the Falchion and Fauchard which we released last year. The NNG appear in the story Paying the Piper, which can be found in the third volume of collected Hammer’s Slammers stories by David Drake. They get a bit of a pasting from the Slammers – but then again, who doesn’t ? This entry was posted on Friday, January 25th, 2019 at 14:18 and is filed under News. You can follow any responses to this entry through the RSS 2.0 feed. You can skip to the end and leave a response. Pinging is currently not allowed.